Take Kuhio Highway heading north. Go past Kapaa Town headed towards Hanalei. Just after milepost 23 you will see a Shell gas station on the right. Turn right there on Kolo Road. Take the first left on Kilauea Road. Go 1/2 mile and Kong Lung Historic Market Center is on your right, on the corner of Kilauea Road and Keneke Street. Parking is available on the left side of the street also next to O’Connor Realty in the grass field. Take Kuhio Highway heading south toward Kapaa Town. Just after milepost 24 you will see a Shell gas station on the left. Turn left there on Kolo Road. Take the first left on Kilauea Road. 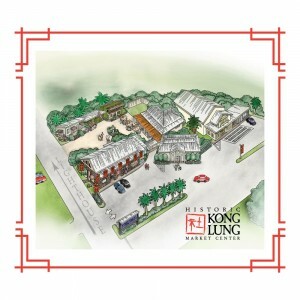 Go 1/2 mile and Kong Lung Historic Market Center is on your right, on the corner of Kilauea Road and Keneke Street. Parking is available on the left side of the street also next to O’Connor Realty in the grass field.